Why do you want automation in CAD? With automation you can rationalize repetitive common tasks to increase speed and accuracy, or as a skilled employee transfer knowledge to juniors by making tools which they can use. V5 has several possibilities for automation/customization. 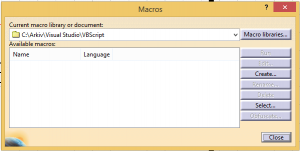 In this blog post, we will look into macros. Knowledgeware is based on geometry for building smartness into the model. 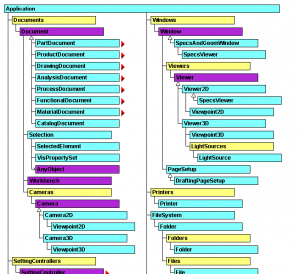 CAA stand for Component Application Architecture and is a C++ interface for advanced users. CATScript is a legacy language kept for compatibility and is converted to VB Script. We are not spending time on that. 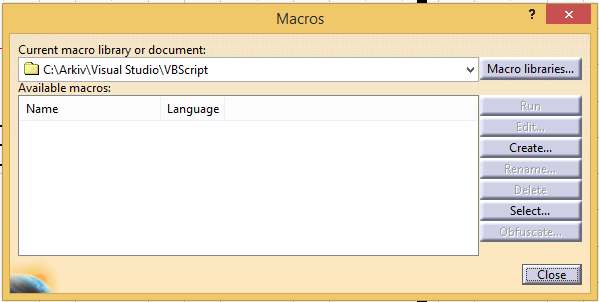 VB Script is a simple sequential language with very simple user interface in form of message boxes, file selection boxes and input boxes. It can be handy when you have small automation tasks which contains a sequential process and does not require an advanced user interface. Only message boxes, input boxes and file selection is available. VBA stands for Visual Basic for Application and is common in Office application and other major software packages. 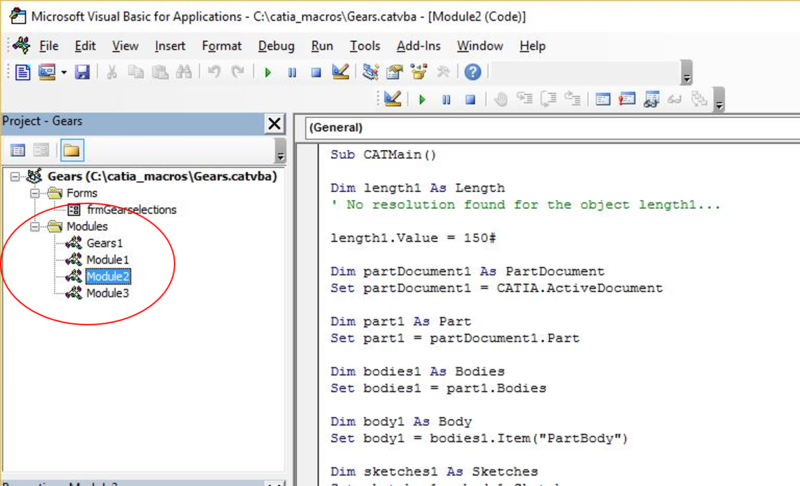 With VBA you are creating macros inside an application, but you can also access other application. 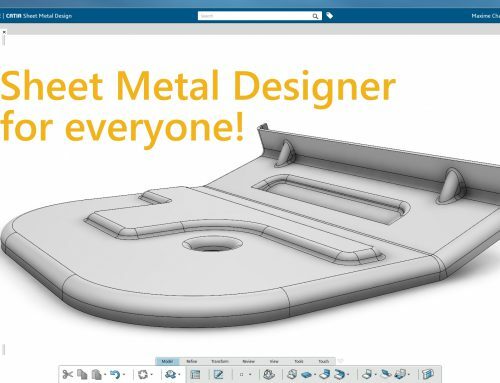 For example, you can call Word or Excel from Catia to fulfill your goal. 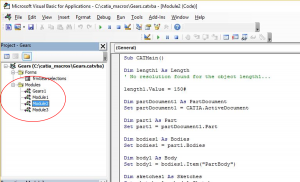 VBA creates an event driven program – the user decides in which order the program is executed. 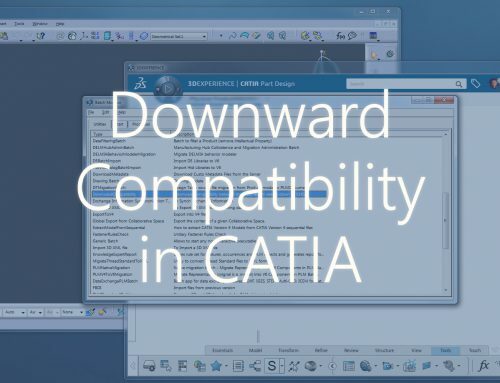 In Catia, you can access macros by tools->macro->macros…, or Alt+F8, or you can select Alt+F11 for open the editor directly. 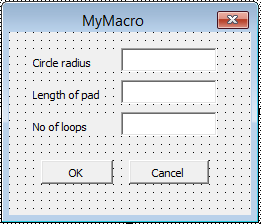 By clicking Macro libraries… you can create a library for your macros. Two different libraries are available, directories and VBA library. Directories contains VBScript and VBA library is for VBA projects. When you open a project in VBA, you are accessing the editor. In left view, you have an overview of your modules and forms. Forms are for user interfaces (UI) and can contain your complete code. Modules can both contain complete macros without UI, or subroutines or functions called from forms. 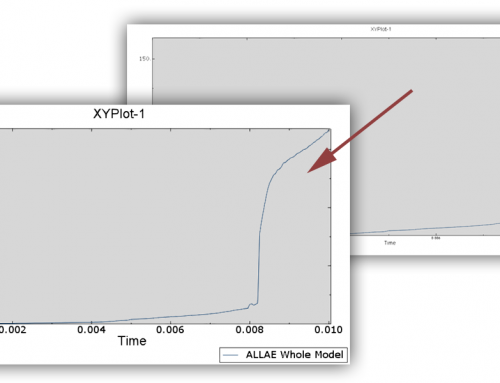 Will be beneficial if you develop functions which is standardized and used in several forms/modules. In the form, you can add other objects like textboxes, buttons, pictures, labels, check boxes etc. from the toolbox. Labels are used for information to the user, like a header above a textbox to inform the user which kind of information is expected in the textbox. User cannot change a label, but you can change the label in code depending of user action if you will have a more interactive user interface. Caption – Content of the label, text presented to the user. 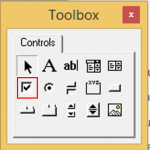 Text – content of the textbox, can contain a default value or left blank for user input. Name – Name of the textbox, used in code to access object. 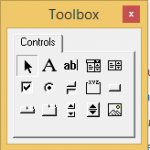 ComboBoxes let the user select different predefined values. You can also allow the user to input his/her own values by typing another alternative into the ComboBox. MatchRequired – This is a Boolean variable, which can either be true or false. Set to false allows the user to select his/her own value, not one from the dropdown menu and set to true, you have to select one from the list. Listboxes work much like ComboBoxes, but present a list in a scrollable window. Checkboxes is used for additional choices and multiple checkboxes can be selected simultaneously, or not at all. OptionButtons are giving the user multiple choices and only one choice can be selected. Statements in VB is a complete instruction. Two different types of statement exist. Declaration statements are like when you are naming a variable, constant or a procedure and can also specify a data type. Executable statements initiate actions, like calling a method or function and can loop through a block of code. We will show you examples where we use executable statements and explain how they work. For next loops are used to execute something a specific number of times. In the following example, we are executing a messagebox 10 times. Dim Counter as integer, just tell the compiler that Counter can take integers (1,2,3…) and it is a declaration statement. Next line says as long as Counter is less than or equal to 10, then do this. We give Counter an initial value to 1. Will give the following output: HelloWorld. Next tell the program to go to: For Counter=1 to 10 again. For Counter=1 to 10 is evaluated again and if it’s still true, it will continue with the next value of Counter. It will continue as long as Counter is less or equal to 10. If Then Else is evaluating the condition. I it is true, it is executing the following statements, if it’s not, it’s going to the Else block. If Counter is equal to 4, the first block of code is executed, if it is not, then the second is executed. An If Then Else statement is executed only once. End if is ending the if statement. A select Case is selecting between several condition. Only one Case can be true. First sentence: Select case indicate a “select case” statement. Textbox.text is the value you try to match. Case “Yes”: this action is chosen if the text is exactly “Yes”. Please note it is case sensitive. Case else: is chosen if none of the above fits and End Select ends the Select Case statement. Until now, we have discussed general VB functionality. It is common for all application which is using VBA. 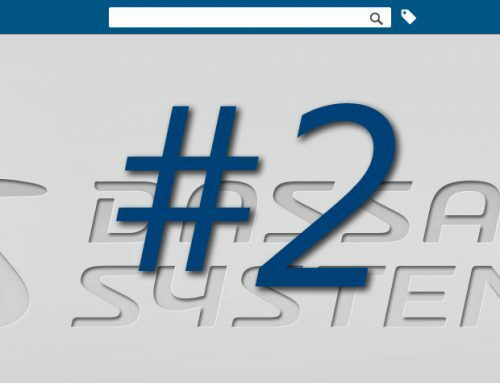 For an overview of objects in V5, you can refer to V5Automation.chm which in default installation is located in “C:\Program Files\Dassault Systemes\ Bxx\win_b64\code\bin\V5Automation.chm” where Bxx is replaced by your installation level. If you are using 32 bits windows, you have to replace win_b64 with intel_a. Below you will see an overview of available objects in V5. Create the same pad with 50 mm horizontal distance four more times, totally five pads. solves our first task. We add a document (Part) to our collections of documents. We can also see that variables for known features are created, like bodies and sketches. Some references are also created, since we must use reference to a plane when creating a sketch and not the plane. Input in  is optional, so only required input is Prompt. “as String” shows us that returned variable is String. We are forcing this returned string into a double. If you have found this guide interesting, I encourage you to expand your macro into a nicer user interface. We are now adding form to our macro, which will be event driven instead of sequential. Remove inputboxes and use textboxes from form instead. Use the debug menu to step through your code to observe what code is creating what. Why can you delete those two If … Then sentence to check which loop we are in? Why and how can you remove those two variables we stored our length and radius in? Try entering text into text fields and observe the error generated from compiler. How could you check input before the compiler generates an error? Decide if you stop the macro, or force the user to enter correct values. How can you add default values to your input form to help user understand input type? Stop the macro after its done. Nice article. Good for beginners. Can you please share the same for 3DXP? 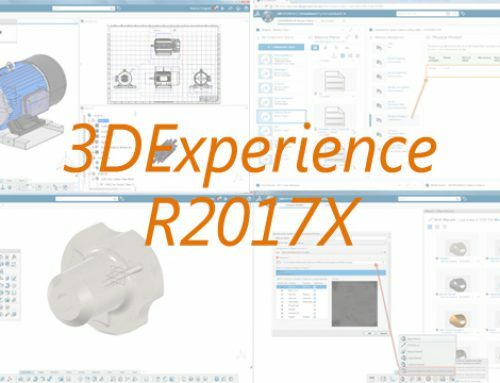 Yes, we will publish an article in near future for 3DXP and programming.